It seems like every year I have a student (usually a boy) who can't sit still or needs to be fidgeting with something in order to pay attention. It took me a long time to realize that when a student is twiddling with something in their desk, doodling, tearing up an eraser, or turned upside down in their chair, they are not just playing or trying to ignore me. In most cases, they are actually listening better than if I had made them sit quietly with their hands on their desk! 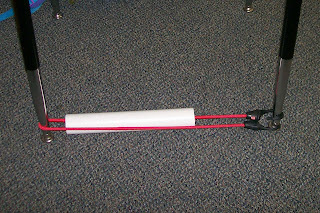 Of course, all of this activity can be distracting and disruptive to the rest of the class, so the vice-principal at my school came up with an ingenious solution that requires a bungee cord with hooks on each end and a PVC pipe. Slip the pipe over the bungee cord and hook it to the desk leg. The student has a place to keep his feet busy while keeping his bottom in the chair. I started using this with a student this year and it has really helped him stay focused and on task. Every once in a while I have to ask him to not be so noisy with it, but most of the time it is barely noticeable. The feet stay busy while the student is engaged and on task! you can also cut "pool noodles" and use a rope to tie it to the desk legs. The noodles don't make a lot of noise. I have not had to use this in a few years but I am thinking with "spring in the air" I may do this again. Thanks for the reminder. Ok, that's smart. I have enough time to work on this before school on Monday. Please be aware of eye injuries and bungee cords! Good advice! Luckily, the hooks stayed securely on the legs of the desk and didn't come off - even with the busiest of feet working it!